The man who dies thus rich dies disgraced. - Philanthropist Andrew Carnegie saw giving to charity as most constructive when done directly by the person who accumulated the money. Warren Edward Buffett, the second richest man in the world, has committed to give away 85% of his $44 billion fortune, most of which would be going to the Bill and Melinda Gates Foundation. 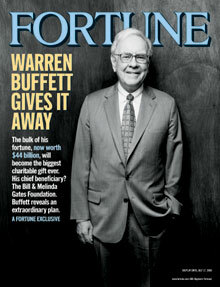 Buffet will also join the board of Gates Foundation. The longer answer is that over the years I had gotten to know Bill and Melinda Gates well, spent a lot of time with them having fun and, way beyond that, had grown to admire what they were doing with their foundation. I've seen them give presentations about its programs, and I'm always amazed at the enthusiasm and passion and energy they're pouring into their work. They've gone at it, you might say, with both head and heart. This makes it the single largest monetary donation in history. Bill Gates recently announced plans to retire from Microsoft in 2008 to focus his attention on philanthropy. This news was indeed stunning. Buffett, 75, has for decades said his wealth would go to philanthropy but has just as steadily indicated the handoff would be made at his death. Now he was revising the timetable.